Dinosaurs seem to be a very popular theme among preschool children. 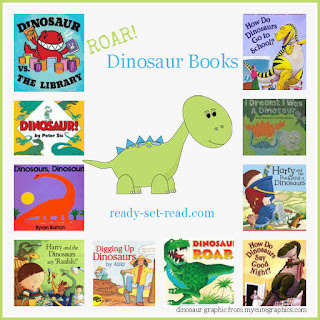 My boys love reading about dinosaurs and we have many favorite dinosaur theme picture books. Each Monday on Ready-Set-Read, I am compiling books to accompany various preschool themes. This week, I am exploring the dinosaur preschool theme. While there are many, many books that would fit the dinosaur theme, these are some of my favorite dinosaur books that have worked especially well with the preschool reading level. Clicking on the book cover will take you to the book on Amazon for your convenience. These are affiliate links. How do Dinosaurs... Series by Jane Yolen To begin a dinosaur theme book list, I feel like I have to begin with Jane Yolen. Yolen has many books featuring dinosaurs. In Yolen's books, dinosaurs deal with bedtime, going to school, cleaning their rooms, celebrating holidays and more. The illustrations in the book, by artist Mark Teague, label each dinosaur. The books are great for dealing with preschool behavior, but don't give any information about dinosaurs. Another series of books that uses dinosaurs to focus on preschool topics, are the Dinosaur Vs. Books. These books, like Dinosaur Vs. The Potty, by Bob Shea tell a story about a dinosaur who doesn't think he needs to use the potty. The obnoxious dinosaur jumps around and roars. Preschoolers will love "roaring" along with the dinosaur. (And what's a dinosaur unit without roaring?) Again, this series, will not teach facts about dinosaurs but they are fun for kids to explore during a theme study. Digging Up Dinosaurs (Let's-Read-and-Find-Out Science 2) by Aliki follows a child through a museum of dinosaurs. As the reader moves through the book, he/she can read simple facts about dinosaurs on each page. Along with the main text, there are speech bubbles to listen in on conversations in the museum. Some of the conversations are educational, others are entertaining! This is a good book for introducing names of dinosaurs, types of dinosaurs, and the concepts of extinction and paleontology. Dinosaurs, Dinosaurs by Byron Barton is a wonderful "first" dinosaur book. In Dinosaurs Dinosaurs, Barton provides simple, brightly colored drawings of dinosaurs with simple descriptive text. For example, "There are dinosaurs with horns." This book is great for preschoolers to learn to understand the descriptive words without having to cover all of the details. In the front and back endpages, the book provides clear pictures with labeled names and pronounciation guides for kids who want to know more. Dinosaur! by Peter Sis is a wordless story about an imaginative boy and his toy dinosaur. The book begins with bathtime. The boy takes his toy dinosaur into the bath, and suddenly, a dinosaur pops out of the water. Gradually, larger and larger dinosaurs begin to appear around the bath. The boy gets smaller and smaller. The book opens to a three page spread, to fit all of the large dinosaurs. As the page turns, the boy's mother comes rushing with a towel, and bath time-- and play time-- are over. The bathroom is covered with water! Judging from how our bathroom looks after bathtime, I wonder if my boys have had dinosaurs visiting?? Harry and the Bucketful of Dinosaurs (Harry and the Dinosaurs) Harry finds a bucket of old dinosaurs in Gran's attic. "Dinosaurs don't belong in boxes," says Harry. Harry washes the dinosaurs, puts them in a bucket, and takes them everywhere he goes. Until one day, Harry mistakenly leaves the dinosaurs on the train. But he knows how to get them back. I believe this book was originally published as Sammy and the Dinosaurs We've been reading that one since Logan was 2! Follow the link to an old post with a book activity and a picture of little Logan! There are several other Harry and the Dinosaur books. My boys really liked Harry and the Dinosaurs Say 'Raahh!'. which was a fun story about Harry taking his bucket of dinosaurs to visit the dentist for the first time. I Dreamt I was a Dinosaur is an easy to handle board book. Each page features a different dinosaur and names it alliteratively, for example, the Stegosaurus is named "Sammy Stegosaurus." According to the book, "The illustrations were prepared in antique fabrics and felt with sequins, buttons, beads, and assorted bric-a-brac." Which would be completely awesome... if you could actually feel that. However, I guess it was too costly to mass produce books with antique fabric and bric-a-brac. (I love that word). So the book is just pictures of those things. Check out the dinosaur craft project we did to make our own dinosaur touch and feel book after reading this book. Last week, I asked for recommendations of favorite dinosaur picture books on my facebook page. Laura, from The Seeds Network, recommended this last dinosaur book, Dinosaur Roar! It looks so fun. Make sure you check out the video in the post. My boys loved the book and boogie dance that went with the book. This is a great book for teaching preschoolers about opposites. Dinosaur Roar (Picture Puffins) Dinosaurs of every shape and size race, roar, and stomp through this colorful book of opposites. And where are all these silly-looking creatures off to? A dinosaur picnic, of course! These prehistoric pranksters and the simple, playful rhymes that accompany them will delight children everywhere. Do you have a favorite book for teaching preschoolers about dinosaurs? Leave it in the comments or join our discussion on facebook. If you are looking for more book lists to accompany preschool themes, check out my books by theme page, and follow my preschool themes pinterest board for activities and books. we have a how do dinosaurs take care of their cat book and the boys love it. we will have to look for the ones you have listed here. Great list!